Due to unexpected reconstruction, our Boylston store was temporarily closed the past two weeks. Today, our doors are open ... just in time for you to discover a world of unique holiday gifts and festive entertaining items, all at exceptional values. There is a note that the furniture collection is still not available at this time, but the rest of the store should be - the email was from 11/28. Any word on whether Atlantic Fish has reopened yet? I haven't had a chance to walk thru the area yet. 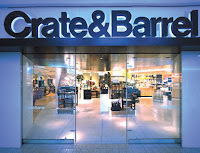 0 Response to "Boylston Crate & Barrel Reopens 11/28"